(Sept. 15, 2009)--A performance at UTSA by magician Justin Kredible and his Outta Control Magic Show has been canceled because of a conflicting television contract. The UTSA University Center Program Council (UCPC) had arranged the appearance, which will be rescheduled. Watch UTSA Today for information on an upcoming performance. 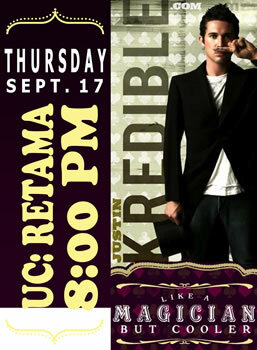 Kredible offers a dynamic mix of comedy and magic that quickly established him as one of America's premier performers. No stranger to college crowds, he was named Entertainer of the Year three consecutive years by Campus Activities magazine. The UCPC is a student-led organization that provides University Center activities and programs for UTSA students. Activities are designed for and by students and provide UCPC members with leadership opportunities and hands-on learning as they plan, implement and evaluate a diverse range of activities and programs that help support the university's educational mission. The organization always seeks members. For more information, visit the University Center Program Council Web site or stop by the office in University Center Room 1.02.08, between the elevator and information center across from the bookstore. For more information, e-mail the University Center Program Council or call (210) 458-6044.